There’s no question that a cloud-based IT model delivers a great many benefits for businesses of all sizes. The value proposition is clear and well-documented: easy provisioning, flexible scaling and, in some cases, cost savings. And as the cloud matures, an increasing number of applications and workloads are running in the cloud as well. All this has brought cloud computing to the mainstream. Multiple analyst surveys have shown that the majority of businesses have adopted some form of cloud computing. But despite the obvious attractions of the cloud, it is not always feasible or desirable to move to a 100 percent public cloud model. The reasons include security, control, performance, regulation and policy. As the cloud has grown in maturity and popularity, a consensus has also grown among industry commentators, IT suppliers and customers on the optimum way of consuming cloud resources and integrating them with the IT that, either through necessity or choice, will always remain on site. Hybrid IT has emerged as the new norm, delivering the best of both worlds: the hands-on control of on-premises IT with the flexibility and commercial subscription model of the cloud. SMBs must be continuously inventive and competitive. These drivers of innovation and competition require a great level of flexibility to accommodate and foster innovation. A cloud-based IT model can provide this flexibility. When hybrid IT is delivered as a service, the cloud commercial model, with no up-front capital expenditure and predictable subscription charges, can extend across an SMB’s IT estate, including both public cloud and on-site IT infrastructure. This reserves precious capital and provides a smooth IT investment path for growing businesses. On-premises IT can be costly to manage. Adopting hybrid IT as a service eliminates the capital and operational costs associated with buying, provisioning and keeping on-premises IT up to date and secure, allowing scarce IT skills to focus on business value. Hybrid IT is a perfect blend of on-premises IT and cloud-based IT that is well-suited to SMBs’ needs. It delivers true choice with regard to where your data resides, and enables SMBs to retain the aspects of their local IT capability most important to them. When hybrid IT is purchased “as a service,” it also eliminates the capital outlay required for infrastructure refresh. In addition, with end of support looming for key technologies such as Windows Server 2003, the availability of hybrid IT for the SMB is extraordinarily well-timed. But moreover, hybrid IT is a strategic business decision that supports a business long-term as it grows and changes. Hybrid IT is firmly established as the new norm. This is a good thing, because hybrid IT, with all the benefits it brings, is how IT should be for SMBs. Still, SMBs must take care to select the appropriate solution. Some large vendors offer solutions targeted at the big enterprise market. Such solutions are excellent for large data centers and large budgets, but not designed for SMB economics and requirements. Additionally, some local IT experts and suppliers look to manually integrate off-the-shelf solutions in an effort to address the requirements on a per-customer basis. These solutions lack economic benefits, with typically high capital-intensive upfront costs, and without the economies of scale that the cloud model delivers. 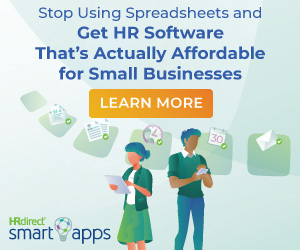 Software is not kept up to date and consistent across customers, support costs are higher, SLAs harder to maintain and businesses still face an expensive refresh cycle every few years. SMBs should instead consider options that deliver enterprise-grade hybrid IT as a service, enabling them to choose the right blend of local and cloud IT to scale with their business, without the need for upfront capital costs or expensive future upgrades. 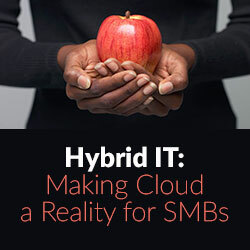 With hybrid IT as an option, SMBs no longer must make a painful choice between on-premises and cloud-based IT. They can instead enjoy the best of local and cloud IT — IT as it should be for the SMB. 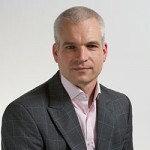 Nick East is chief executive and a cofounder of hybrid IT startup Zynstra. Back in 1961 when MIT professor Prof. John McCarthy first introduced the idea of “cloud computing” he envisioned a future where computing was offered as a utility like water or power. When hybrid IT is offered as a service, it is basically an additional utility for SMBs. Gone is the need for in-house physical hardware and in-house staff for monitoring and maintenance. Instead, entire IT infrastructures can be delivered for a monthly service fee.